Kaohsiung, Taiwan. April 4th 2018. Industrial display manufacturer, KOE, has announced the introduction of a new 7.0-inch Rugged+ TFT display. The TX18D212VM0BAA features WXGA (1280 x 768 pixels) resolution, a 5:3 wide aspect ratio, an extended operating temperature range and IPS (in-plane switching) wide viewing angle technology that delivers exceptional optical performance. Designed for use in high reliability industrial, in-vehicle, medical, aerospace and marine environments the Rugged+ 7.0-inch display is suitable for use where extreme temperature, mechanical shock and vibration are present. 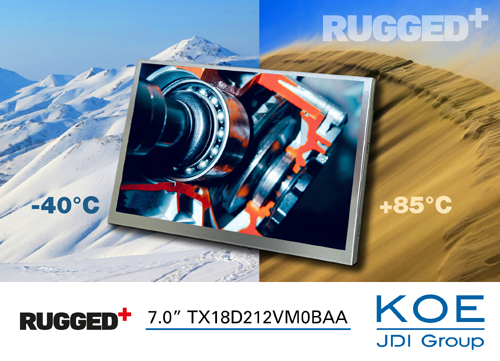 The environmental and optical specifications of KOE's Rugged+ display modules are derived from the same exacting standards as used in automotive specification display modules. When used in human-machine interfaces, IPS display technology delivers exceptional colour saturation and image stability, high contrast and deep black levels with 170° wide viewing angles (vertical and horizontal). The 7.0-inch display features a contrast ratio of 1000:1 and a white LED backlight with a brightness specification of 1000cd/m². The display module has a built-in dimming control allowing backlight brightness to be controlled with a PWM or DC voltage input. Jason Tsai, Marketing Manager, KOE, said, "KOE's new high performance, high resolution 7.0-inch display benefits with exceptional optical performance, highly consistent colour reproduction and wide viewing angles through the implementation of IPS technology. Additionally, Rugged+ displays have been specifically designed and developed to have robust electrical, mechanical and environmental characteristics that are highly resistant to vibration, shock, electro-static discharge and temperature variation." The 20-pin LVDS interface supports 8-bit RGB, which enables a colour palette of up to 16.7M colours.The display module is manufactured using COG (chip-on-glass) construction and has mechanical outline dimensions of 164.4mm (w) x 105mm (h) x 13.5mm (d) and an active display area of 152.45mm (w) x 91.47mm (h). The Rugged+ module supports a wide operating temperature range of -40°C to +85°C and storage temperature range -40°C to +90°C. KOE is committed to ensuring long-term product availability, with continuity of supply essential for many industrial products and equipment. The latest KOE Rugged+ displays can be sourced and supplied for a minimum of 5 years. The new 7.0-inch Rugged+ TX18D212VM0BAA TFT display module is available immediately from KOE's sales channel distribution partners.